General Sessions set the tone for the overall conference experience. Many conferences are looking for a different general session experience than the traditional motivation message or lecture by a professional. 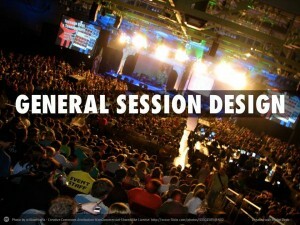 Advice on general session experience design…unique, customized, interactive, memorable. Commission free professional speaker recommendations. Coaching keynote speakers for customized and high-participatory ballroom/general session experiences. Complete content marketing plan for general sessions. Content mapped to organization’s strategy/goals. Conferences with professional speaker budgets of $30K + and desire to get the most bang for their buck. Interested in big ideas, not big names. Attendance at general sessions is below expectations.